Previously I wrote about how I love open spaces, also in my own home my living and kitchen are connected to each other which gives the home a nice flow. What was a separate smaller kitchen and a middle sized bedroom are now the heart of the home where I love to cook and work at the huge table. I was lucky to be able to choose the look, and design my kitchen during a small renovation a few years ago within the possibilities given that time. We are all unique and live different in our homes, we have other needs in our kitchens and our houses look different. Some have great features from the past and other are more contemporary. 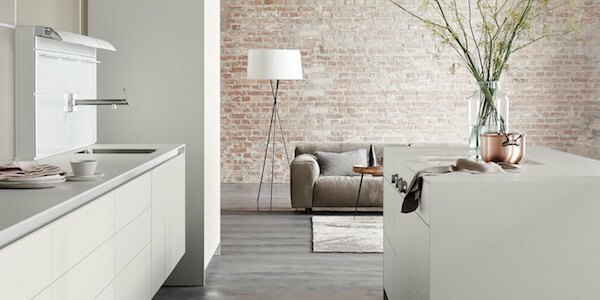 When it comes to designing your new kitchen, bulthaup b3 gives you the freedom to let your design ideas and dreams be fully realized fitting perfectly the character of your home to the smallest detail of your new kitchen. 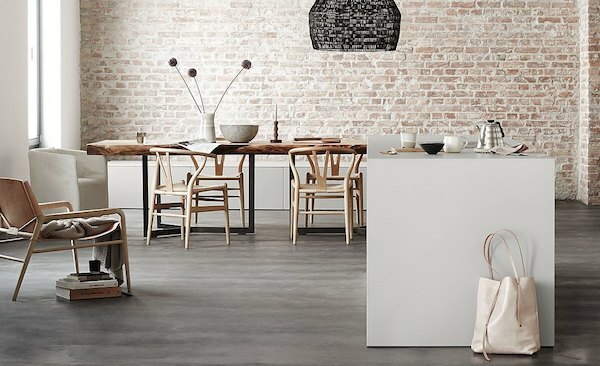 Every kitchen needs a centerpoint and depending on your personal taste and circumstances you can either choose for a floor-standing island creating a more sculptural look in the room or a foot-supported island to cook and gather around. 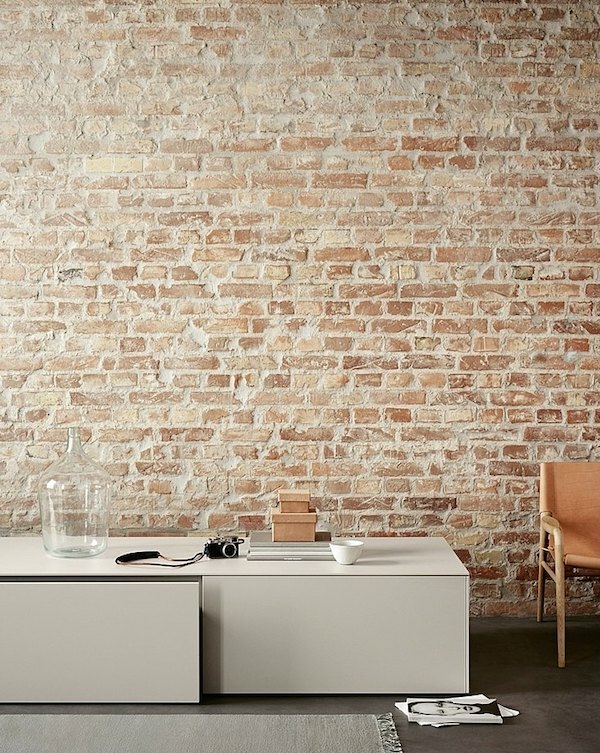 The multi-function wall creates storage space, supports functions such as the water point, and connects the furniture with the room; this spatial connection is tangible when the wall supports hanging elements. The result is the appearance of a floating kitchen. 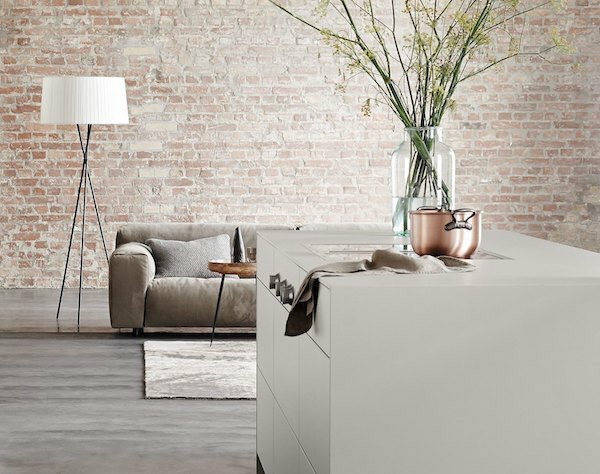 Because of the endless possibilities in materials and design both the island and the multi-function wall of the b3 kitchen can be fully personalized to become part of your home. The material you choose for your b3 will definitely put a stamp on any living space and is of course really personal and maybe also a bit influenced by the fact if you love to follow and use certain trends in your home. Whether it be century-old bog oak, through-dyed laminate, or surfaces with multiple layers of lacquer though, every texture and finish of each b3 is individually accomplished by craftsmen and unique. 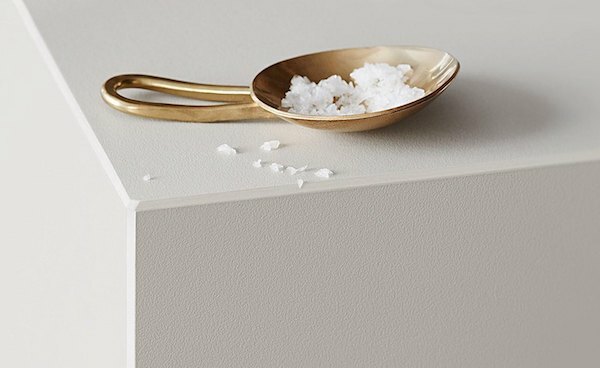 With an eye for detail the different materials are used to build your kitchen, the bulthaup b3 veneer front for example is a custom-made, one-of-a kind-creation made from a unique trunk. The veneer master craftsman selects exactly the right veneers for each kitchen. He puts the veneers together by hand to create a harmonious surface. The result is a homogeneous unit in your living space. While The solid wood fronts are 13 mm thick and consist of five layers: Three solid wood layers, sandwiched together with two fine aluminum layers, create an attractive edge. Wood communicates well-being and warmth while a high-gloss surface can make the room look bigger and matt lacquer is calming to the eye. 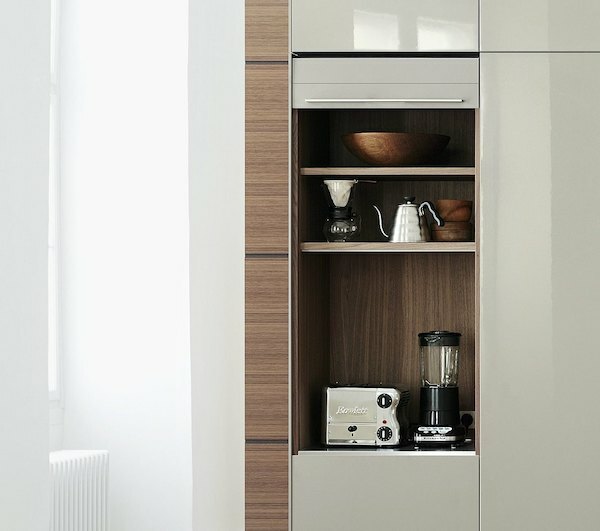 Or maybe you prefer a minimalist appearance and a kitchen in bulthaup laminate. 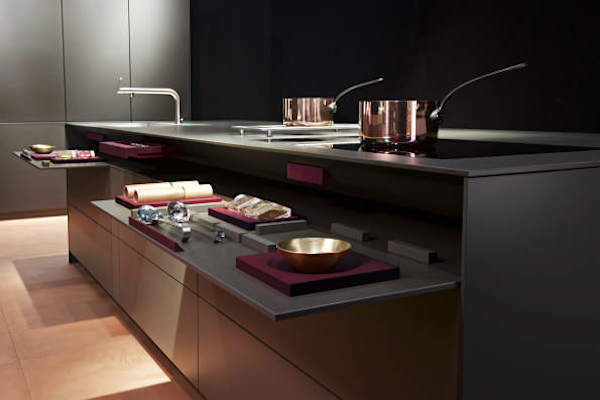 Stainless steel recounts the personal story of your kitchen. It develops traces of use over time, creating an individual patina and unique character. Combined with materials such as laminate, lacquer, or wood, metal is the ideal design element for creating an atmosphere of thoughtful elegance. This year's Milan Salone showed us a redesigned b3 island! 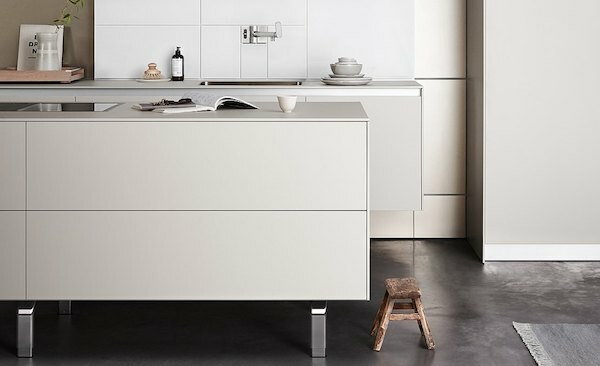 The reinterpreted bulthaup b3 island lends itself to modular planning, following the personal preferences and needs of its users. Functions that were previously positioned on the wall in the area behind the work surface are now located in the island. Whether it is an end-to-end worktop or an open sink, the island is the center of gathering and conversation, allowing people to prepare food and cook together comfortably and efficiently. On the kitchen side of the island are the sink, preparation surface and hob. Directly below the end-to-end work surface, small pullout modules house the utensils needed for each functional area. 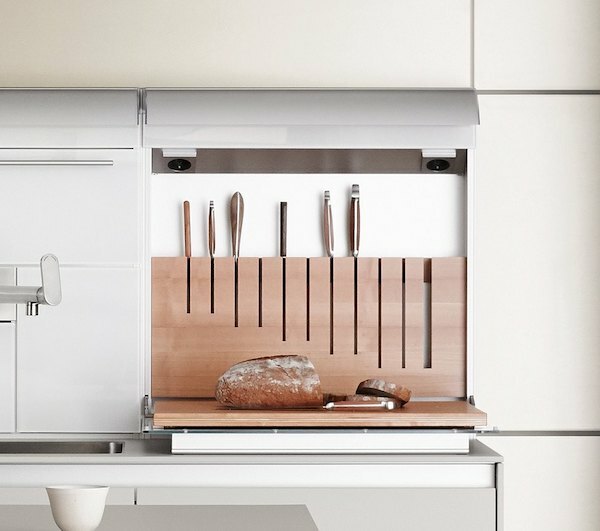 The pull-out functional board below it accommodates kitchen tools, accessories or even spices. The opposite side of the island provides storage space for things that are needed in the adjacent dining and living area. Laminate was chosen as the material for this island: anthracite for the work surface and flint for the fronts. b3_island_9172 In line with requirements, the pull-out functional board offers direct and rapid access to key utensils or serves as an extended work and storage surface. The contents of the trays can be arranged with total flexibility, reflecting the wishes of their users. Storage space is one of the most important requirements of any kitchen. 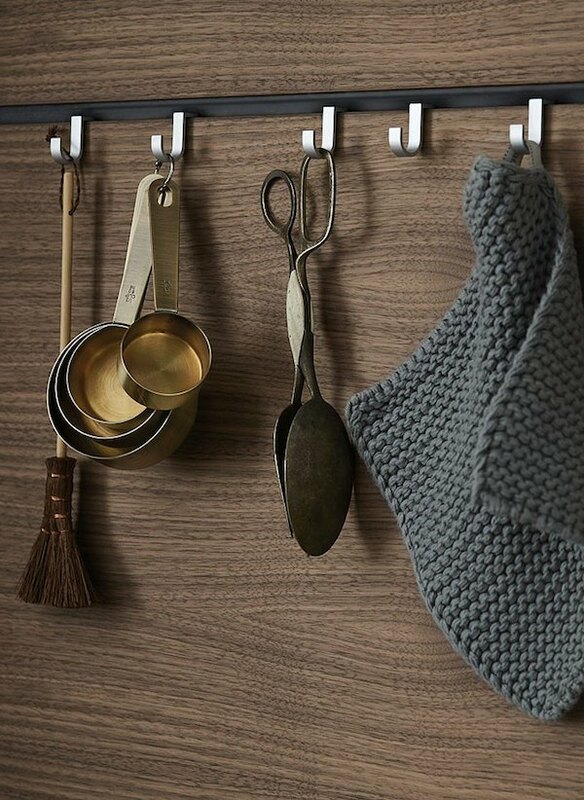 Being able to create a kitchen based on your habits and needs is just amazing I think and the habit of creating space where you need is is something I also use in my own home, being it a kitchen drawer or a simple hook there where you need to hang your bags. Creating space where you need it is also very different for everyone. Some like to take the option to organize their cabinets behind doors and other may want to display personal objects openly. 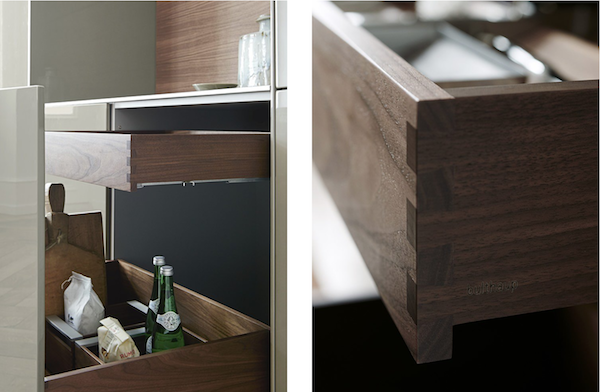 Either way, the bulthaup aesthetic ensures that all your items are beautifully presented, concealed inside or out on view. I personally love the Pocket door unit shown above where aesthetics and functionality are beautifully balanced. The doors are solid and heavy, and yet simple and light to operate. Kitchen utensils and electrical appliances can be stowed away perfectly behind the closed doors. Small appliances that we daily use can also be hidden behind sectional shutters. With the shutter open, they are within easy reach whenever you need them. They can also be just as easily shut away. When closed, the sectional shutter naturally blends in with the kitchen’s overall appearance and is available in aluminum or various colors of laminate. 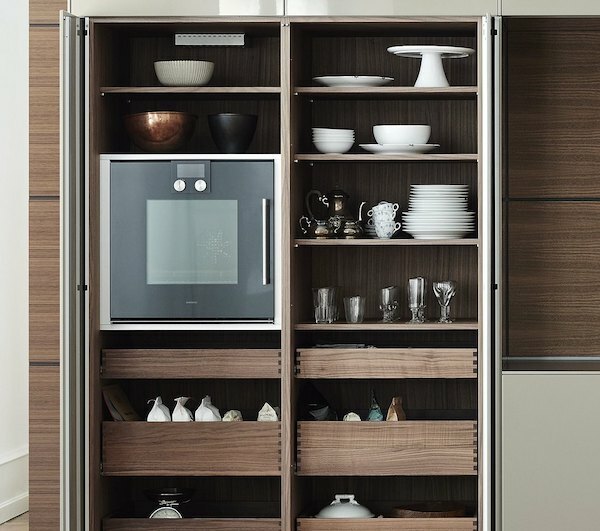 In the wall unit additional storage space can be created with function boxes including elements such as knife blocks, chopping boards, or mixer faucets. Whatever solution you prefer, every function box includes embedded light fixtures. bulthaup creates the ideal conditions for you to work and design your personal workspace and everything has been thought of, from the high quality of the surfaces and the right lighting to unique waterpoints, bassins and of course there where we cook our food the fireplace, the ideal place for frying, steaming, and poaching. bulthaup offers different accessories for even more easy storage solutions and personality to your kitchen and we had the pleasure to create a series of images with a few selected items for bulthaup, which we will show you more of in the coming weeks in a returning series of blogposts. At the vtwonen & design fair at the Amsterdam Rai bulthaup will showcase several inspiring setups with the bulthaup b3 island as well as the new bulthaup b Solitaire tables and elements. Solitaire elements will form the connection between the tables and the bulthaup b3 island setups. The b3 island setups, executed in the most up-to-date materials, invite you to work together in the kitchen and then enjoy the result at the table with friends, family and acquaintances. De vt wonen & designbeurs is de plek om inspiratie op te doen voor het interieur. U vindt er de nieuwste ontwerpen volgens de laatste trends onder één dak. bulthaup is ook deze editie weer van de partij en toont een inspirerende stand waarop naast een tweetal bijzondere bulthaup b3 eilandopstellingen ook de nieuwe bulthaup b Solitaire tafels en elementen worden gepresenteerd. De b Solitaire tafels vormen het hart van de stand en worden omringd door de Solitaire elementen die de verbinding vormen tussen de tafels en de bulthaup b3 eilandopstellingen. De b3 eilandopstellingen, uitgevoerd in de meest actuele materialen, nodigen uit om gezamenlijk aan de slag te gaan in de keuken om vervolgens te genieten van het resultaat aan tafel met vrienden, familie en kennissen.